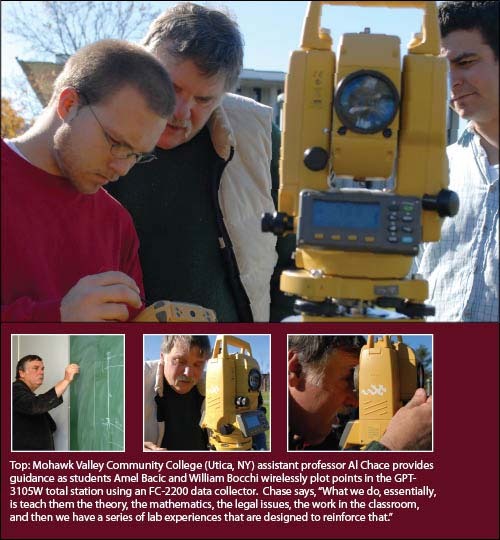 Don’t get Alan Chace wrong—the assistant professor at Mohawk Valley Community College (MVCC), Utica, New York, recognizes that, by the fall 2010 semester, MVCC’s Center for Mathematics, Engineering, Physical Sciences, and Applied Technology needed new surveying total stations for courses that include surveying instruction. The center had been using the same total stations for more than 10 years. But he contends that providing students with the latest technology also sends them a message, and purchasing four newer models provided a valuable benefit beyond new equipment features. MVCC’s center has benefited from financial assistance in a slightly different form than grants since 2005: discounts through Topcon Positioning Systems’ Educational Partners Program. The program, which normally is implemented through Topcon’s dealer network, provides financial support and training for educational institutions. More than 300 schools in the United States are involved in the program. In 2005, MVCC purchased a Topcon HiPer Lite+ base station and rover antenna that students use to learn the intricacies of real-time kinetic (RTK) global navigation satellite system (GNSS) technology. Such GNSS tools are an example of how technological advancements are providing students and professionals involved in geospatial activities with new tools that increase efficiency and precision. Satellites send positioning data to an antenna/receiver combination at the stationary base station. The rover antenna, mounted on a pole, is set at a given location, and the stationary base and rover process the signals together to provide RTK position information with better than 1–2 cm accuracy. Software compares the rover’s position to the design grade at a given location, and the operator can determine the topography of the location by viewing a field controller that is also mounted on the pole. A total station combines an electronic transit and electronic distance measuring device (EDM). Angles and distances are used to calculate the x, y, and z positions of points. Under conventional operation, the electronic transit provides a digital read-out of those angles, and the EDM sends an infrared beam that is reflected off a prism that’s mounted on a tripod or a prism pole. In some cases, no prism is used for obscure measurements, and a reading can be measured up to 350m at 5mm to 1cm accuracy, depending on the distance. The unit uses timing measurements to calculate the distance traveled by the beam. The total station also calculates the locations of points sighted, and many are equipped to record angles, distances, or the coordinates of points. The students use the data to develop an official site survey using CAD software. Prior to the start of the fall 2010 semester, MVCC made its second purchase under the Topcon assistance program to acquire four GPT-3105W total stations. Chace explains that surveying labs typically serve 12 students (or four crews of three each), so four total stations were needed. In addition to the savings, MVCC has received several visits from Topcon representatives who have trained both instructors and students on the new units. The displays on the new units allow more functions, according to Amel Bacic of Utica, who is focusing on civil engineering as well as surveying. As of early November 2010, Bacic and other students were using the total stations conventionally, i.e., in conjunction with a prism deployed separately, and were working on using their “reflectorless” capability. In reflectorless operation, the total station sends high-energy pulses that reflect light back to the station from an otherwise non-reflective object. “The Topcons are reflectorless, so you don’t always have to go out with prisms to get your distances, which is great,” says Bacic. “They can also save a whole lot of time on the job.” In addition to using wireless technology, the new units were designed to have the longest reflectorless range in their class at 350 meters or 1,150 feet; using a prism, the range is 3,000 meters or 9,900 feet. For reflectorless surveying, the unit uses a narrower “dual-optical” beam and a broader beam for surveying with a prism. The total stations and GNSS receivers allow the students to complete hands-on tasks that accompany the theory behind surveying. “What we do, essentially, is teach them the theory, the mathematics, the legal issues, the work in the classroom, and then we have a series of lab experiences that are designed to reinforce that,” says Chace. “We talk in the classroom, for example, about how to read blueprints, and then we come up with stakeout notes for those blueprints, and then we go out in the field, outside of the classroom on the college campus and execute those building stakeouts.